The image above is one of the fields from which our populations Lavender comes from. The bus in front of the building is the PIA tour bus from a recent PIA study trip to Provence. To be clear, the Lavender we offer is not from Bulgaria, Tasmania, the Ukraine or India. It is, in fact, classic Population Lavender from Provence, the French also refer to it as "Lavender fine." The oil combines an effervescent freshness with a noticeable Coumarin note. Despite a very narrow market for Fine Lavender, we are able to keep our prices and even offer a limited quantity in one-liter size. "Lavande fine", in the language of the growers in Provence, is understood to be THE Lavender. It is the oil distilled from populations grown from seed, not clones, of Lavandula angustifolia. This is the finest, most complex and also elegantly gentle Lavender. 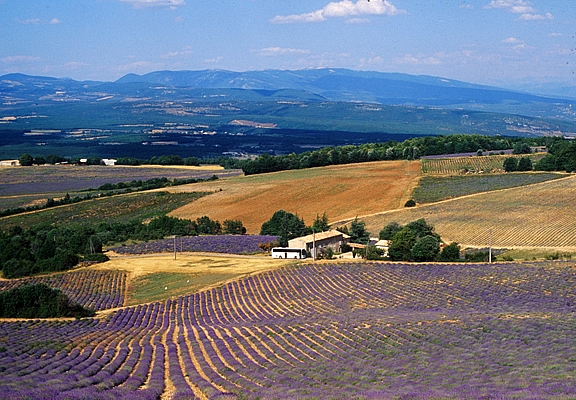 Not too long ago only 20 tons of true population Lavandula angustifolia oil were produced annually in France. In the last ten years, total production has further declined so that in 2012 the total production of population Lavender was probably close to 8 tons. Production in 2015 was slightly up. Liter pricing of Fine Lavender in the market is often very misleading. Many lists offer Fine Lavender at a price below that of Lavender Maillette on the same list, which is an indication that the importer is not quite clear about the concept of Fine (respectively population) Lavender. It is puzzling how there can be prices under $100 listed for 1000 ml of Fine Lavender when the price at the source is pushing 300 Euros. The Lavender OSA offers can rightfully be considered the standard of true Population Lavender. It is AOP certified, produced by the famous COOP in Simiane la Rotonde.